Macula densa (MD) cells of the juxtaglomerular apparatus (JGA) are salt sensors and generate paracrine signals that control renal blood flow, glomerular filtration, and release of the prohypertensive hormone renin. We hypothesized that the recently identified succinate receptor GPR91 is present in MD cells and regulates renin release. Using immunohistochemistry, we identified GPR91 in the apical plasma membrane of MD cells. Treatment of MD cells with succinate activated mitogen-activated protein kinases (MAPKs; p38 and extracellular signal–regulated kinases 1/2) and cyclooxygenase 2 (COX-2) and induced the synthesis and release of prostaglandin E2, a potent vasodilator and classic paracrine mediator of renin release. Using microperfused JGA and real-time confocal fluorescence imaging of quinacrine-labeled renin granules, we detected significant renin release in response to tubular succinate (EC50 350 μM). Genetic deletion of GPR91 (GPR91−/− mice) or pharmacologic inhibition of MAPK or COX-2 blocked succinate-induced renin release. Streptozotocin-induced diabetes caused GPR91-dependent upregulation of renal cortical phospho-p38, extracellular signal–regulated kinases 1/2, COX-2, and renin content. Salt depletion for 1 wk increased plasma renin activity seven-fold in wild-type mice but only 3.4-fold in GPR91−/− mice. In summary, MD cells can sense alterations in local tissue metabolism via accumulation of tubular succinate and GPR91 signaling, which involves the activation of MAPKs, COX-2, and the release of prostaglandin E2. This mechanism may be integral in the regulation of renin release and activation of the renin-angiotensin system in health and disease. The macula densa (MD) is a unique group of approximately 20 sensory epithelial cells in the distal part of the renal tubular network in close association with the glomerulus, the filtering unit of the kidney. These cells play a pivotal role in physiologic feedback mechanisms, sensing changes in tubular salt content and generating and sending paracrine chemical signals to adjacent contractile vascular smooth muscle and specialized endocrine-like cells that produce the prohypertensive hormone renin. The MD and these effector cells form the juxtaglomerular apparatus (JGA) and control important organ functions, including renal blood flow, GFR, and renin release.1–3 The sensory MD cells are strategically positioned in the JGA with their apical membrane exposed to the tubular fluid, whereas their basilar aspects are in contact with the JGA effector cells. GPR91, a recently classified metabolic receptor that is highly expressed in the kidney, can lead to JGA renin release and renin-dependent activation of RAS, causing increased systemic BP.13,14 Its ligand, the citric acid cycle intermediate succinate, can accumulate extracellularly when the local tissue energy supply/demand is out of balance15; however, the importance of the local interstitial accumulation of succinate as an indicator of ischemic or diabetic organ damage at sites such as the brain,16 liver, and kidney was only recently recognized.14,17 Moreover, in diabetes, the accumulation of succinate is detectable in the plasma18 but even more significantly in the renal tubular fluid as well as in the urine14; therefore, it can potentially be introduced into the medical field as a new biomarker of local tissue damage. Because of its anatomical position, the MD plaque is ideally situated to provide an easily accessible site to detect succinate levels in the urinary space, permitting the cells the ability to recognize abrupt modifications in tubular fluid composition. In addition, MD cells are equipped with the signaling machinery to regulate imperative organ functions; therefore, we aimed to identify the localization, signaling, and function of GPR91 in MD cells and define its involvement in the diabetic alterations in JGA function. Localization of GPR91 in MD cells. (A) Representative RT-PCR with the presence/absence of GPR91 mRNA in various mouse kidney cell types and whole kidneys. β-Actin run as a control. +/+, wild type; −/−, knockout; WK, whole kidney; control, using only cDNA without primers. Same results were obtained in n = 6 different samples each. (B through E) Immunofluorescence localization of nNOS (B) and GPR91 (C through E) proteins in the rat kidney. GPR91 (red) was localized at the apical plasma membrane of MD cells that were positively identified using nNOS immunostaining (green). Preincubation with a GPR91 blocking peptide resulted in no labeling, confirming GPR91 specificity (E). G, glomerulus. DT, distal tubule. DAPI labeled cell nuclei (blue). Bar = 20 μm. Activation of ERK1/2, also known as classical MAPKs and another class of MAPKs, p38, was found in response to the application of 500 μM succinate to cultured MMDD1 cells. Representative immunoblots (Figure 2, A through C) show that succinate-induced activation of p38 and ERK1/2 in MMDD1 cells occurred within 5 min and that p38 and ERK1/2 activities further increased in a time-dependent manner until at least 15 min after succinate application. Succinate induced a >1.5-fold increase in MMDD1 pp38 and pERK1/2 contents (Figure 2, A through D); however, other TCA-cycle intermediates, such as α-ketoglutarate (data not shown) and citrate, which are not ligands for GPR91, did not activate p38 or ERK1/2 (Figure 2D). Effects of succinate on MD cell signaling. (A and B) Representative immunoblots showing the time course of p38 (A) and ERK1/2 activation (B) after 500 μM succinate application to MMDD1 cells for 0 to 15 min. (C) Glyceraldehyde-3-phosphate dehydrogenase (GAPDH) served as a loading control. (D) Summary of p38 and ERK1/2 activation in MMDD1 cells 15 min after 500 μM succinate application compared with control (Krebs-Ringer-HCO3 buffer). Citrate (2.5 mM), another Krebs cycle intermediate that is not a substrate for GPR91, served as negative control. Error bars represent SEM. *P < 0.05, compared with control (n = 4 each). (E) Succinate-induced elevations in PGE2 production and release from cultured MMDD1 cells, measured using an in vitro biosensor technique. Specially engineered biosensor cells, HEK293 cells expressing the calcium-coupled PGE2 receptor EP1, were loaded with Fluo-4 and positioned next to MMDD1 cells in culture. Effects of succinate (2.5 mM) on MMDD1 cell PGE2 production were measured on the basis of the biosensor cell calcium signal, because, upon PGE2 binding, these biosensor cells produce a calcium response detected by fluorescence imaging. Benzoic acid (5 mM), which has a pKa similar to that of succinate, served as negative control. PD98059 (10 μM), a selective MEK-1 inhibitor, was used as a MAPK inhibitor, and SC58236 (50 μM) served as a selective COX-2 inhibitor. Control, Krebs-Ringer-HCO3 buffer. Normalized changes in HEK293-EP1 biosensor cell Fluo-4 intensity are shown and served as an index of PGE2 release. Error bars represent SEM. *P < 0.05 succinate versus control (n = 6). (F) Dosage-response relationship of succinate-induced elevations in PGE2 production and release from cultured MMDD1 cells; the EC50 was 229.6 μM. SC51322 was used as a selective EP1 receptor blocker (10 μM) in the presence of 5 mM succinate, as described previously6 (n = 3 coverslips and n = 6 measurements). Because p38 and ERK1/2 are essential components of MD COX-2 activation, which in turn results in the synthesis and release of PGE2 from these cells,4–6 additional functional studies tested whether succinate causes COX-2 activation and subsequent PGE2 release in MMDD1 cells. Addition of 2.5 mM succinate to MMDD1 cells caused significant PGE2 release as evidenced by the 5.6-fold increase in intracellular calcium ([Ca2+]i) of HEK-EP1 cells (Figure 2E) that were used as PGE2 biosensors, as described previously.6 These biosensor cells were HEK293 cells engineered to express the calcium-coupled PGE2 receptor EP1. HEK-EP1 cells were loaded with Fluo-4 and positioned next to MMDD1 cells in culture. Effects of succinate on MMDD1 PGE2 production were measured on the basis of the biosensor cell [Ca2+]i signal. Upon PGE2 binding, these biosensor cells produced a calcium response detected by fluorescence imaging. The succinate effect was abolished in the presence of 10 μM PD98059, a MEK-1 inhibitor (1.6 ± 0.1-fold increase in [Ca2+]i), 50 μM SC58236, a selective COX-2 inhibitor (0.9 ± 0.2-fold increase), or in the presence of MMDD1 cells treated with GPR91 siRNA (1.3 ± 0.8-fold increase). Also, 5 mM benzoic acid served as a negative control (1.2 ± 0.2-fold increase in [Ca2+]i) because it has a pKa value similar to that of succinate (Figure 2E). Succinate-induced MMDD1 cell PGE2 production and release was dosage dependent with an EC50 of 229.6 μM (Figure 2F). The effects of saturating succinate concentrations (5 mM) were blocked by a selective EP1 receptor blocker (SC-51322, 10 μM) indicating PGE2 specificity of the biosensor approach (Figure 2F). Because PGE2 released from MD cells is a classic paracrine mediator of renin release from adjacent JG cells,3 we studied direct and acute effects of succinate on MD-mediated renin release using the freshly dissected in vitro microperfused JGA preparation.20–22 Quinacrine, a fluorophore that selectively stains renin granular content, was loaded through the afferent arteriole perfusate and labeled the renin granules in JG cells (Figure 3, A and B). Application of succinate (2.5 mM) through the tubular perfusate caused significant renin release (40 ± 2Δ%), compared with control (4 ± 1Δ%), indicated by the reductions in quinacrine fluorescence (Figure 3C). Succinate-induced renin release was abolished using tissue preparations from GPR91−/− mice (only a 9 ± 1Δ% reduction in renin content). Using PD98059, a selective MAPK inhibitor (also known as MEK-1 inhibitor), or SC58236, a selective COX-2 inhibitor, the effect of succinate on renin release was also abolished (6 ± 1 or 8 ± 1Δ%, respectively; Figure 3C). In subsequent studies, the succinate-induced renin release was found to be dosage dependent with an EC50 of 350 μM (Figure 3D). Direct visualization of succinate-induced renin release in freshly dissected kidney tissue. (A and B) Confocal fluorescence images of JG renin granular content stained by quinacrine (green) before (A) and 30 min after (B) succinate application. 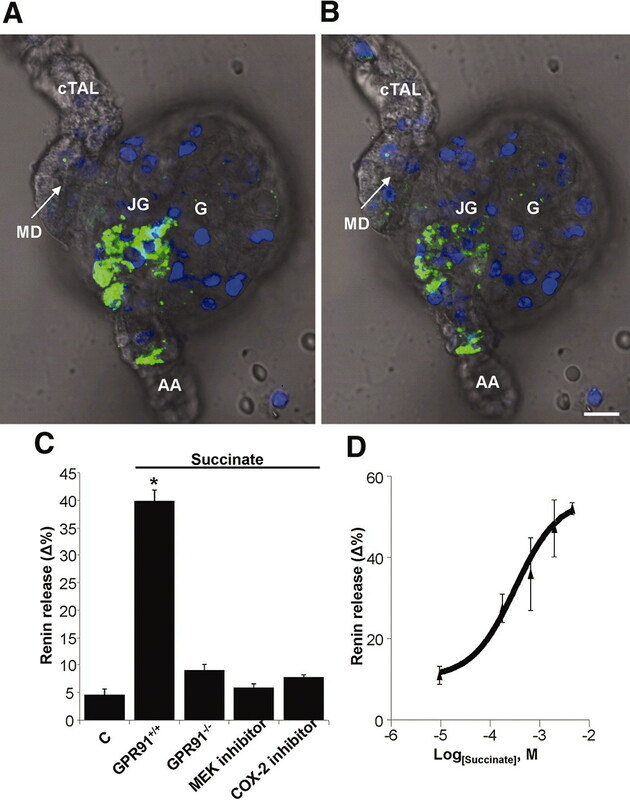 The addition of 2.5 mM succinate into the tubular perfusate caused significant renin release from JG cells, indicated by the disappearance of quinacrine-labeled granules. Hoechst 33342–labeled cell nuclei (blue) and DIC overlay are shown for morphology. G, glomerulus; AA, afferent arteriole. Bar = 10 μm. (C) Summary of the effect of intratubular succinate (S; 2.5 mM) on JG renin release. Normalized reductions in quinacrine fluorescence are shown as an index of renin release. C, control Krebs-Ringer-HCO3 buffer. PD98059 (10 μM), a selective MEK-1 inhibitor, was used as a MAPK inhibitor, and SC58236 (50 μM) served as a selective COX-2 inhibitor. Error bars represent SEM. *P < 0.05 (n = 6). (D) Dosage-response relationship of succinate-induced renin release (n = 6). To confirm the presence and importance of succinate and GPR91-induced MD-renin signaling in the whole kidney in vivo, we measured pp38, COX-2, and renin content of the renal cortex in control and diabetic GPR91+/+ and GPR91−/− mice using Western blotting (Figure 4, A through D). Parallel and significant upregulation of pp38 (three-fold), COX-2 (two-fold), and renin (three-fold) was detected in GPR91+/+ diabetic kidney cortical homogenates compared with control (Figure 4, E through G); however, diabetes-induced elevations in the aforementioned proteins were significantly reduced in GPR91−/− mice (Figure 4, E through G). Also, nondiabetic GPR91−/− mice had reduced levels of renal cortical renin (0.75 ± 0.10-fold) compared with wild-type (P < 0.05; Figure 4G). GPR91-dependent renin expression and signaling in control and diabetic mice in vivo. (A through D) Representative immunoblots showing parallel activation of p38 (A) and upregulation of COX-2 (B), renin (C), and GAPDH (D) in diabetic (DM) GPR91+/+ but not in GPR91−/− and nondiabetic control (C) mice. (E through G) Summary of densitometry analysis of renal cortical pp38, COX-2, and renin expression. Densitometry values were normalized to GAPDH and to control (nondiabetic GPR91+/+ mice). Fold increases in pp38, COX-2, and renin expression are given. Error bars represent SEM. *P < 0.05 DM GPR91+/+ versus DM GPR91−/−; #P < 0.05 C versus DM GPR91+/+; §P < 0.05 C GPR91+/+ versus C GPR91−/− (n = 3 each). Next, the localization of ERK1/2 activation in diabetes was studied using immunohistochemistry (Figure 5, A through D). In the JGA region, the immunolabeling was found to be specific for cells of the MD and the adjacent cortical thick ascending limb (cTAL). In diabetes, we found significant upregulation of pERK1/2 (8.5-fold; Figure 5, C and E) compared with control in GPR91+/+ mouse kidney sections, whereas pERK1/2 levels were below the limits of detection in kidneys of GPR91−/− mice in either control or diabetes (Figure 5, B, D and E). Immunolocalization of pERK1/2 in control and diabetic kidney. 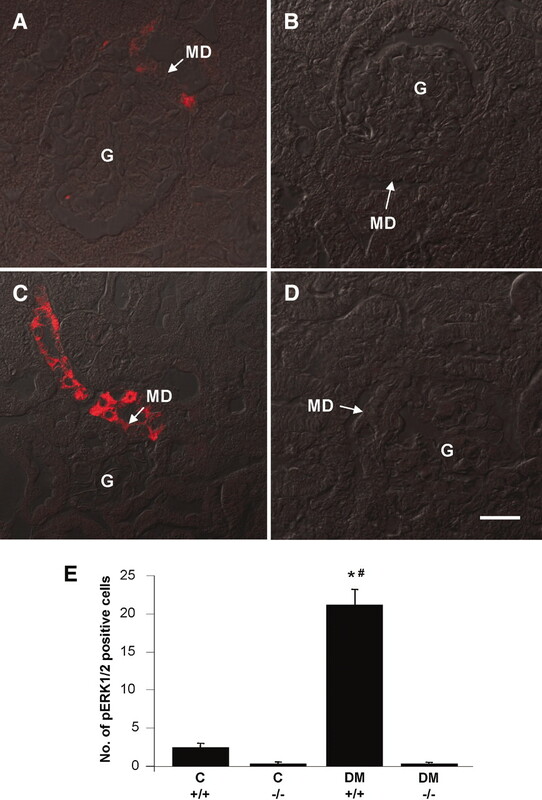 (A through D) Representative images of pERK1/2 immunofluorescence (red) in control nondiabetic GPR91+/+ (A) and GPR91−/− (B) and diabetic GPR91+/+ (C) and GPR91−/− (D) kidneys. G, glomerulus. DIC overlay is shown for morphology. Bar = 10 μm. (E) Summary of pERK1/2 levels in control nondiabetic (C) and diabetic (DM) kidney sections based on the number of ERK1/2-positive MD cells per JGA. Error bars represent SEM. *P < 0.05 DM GPR91+/+ versus DM GPR91−/−; #P < 0.05 C versus DM GPR91+/+ (n = 6). To test further the importance of MD GPR91 in JGA renin control, we studied the effects of salt depletion, a well-characterized model that, similar to diabetes, involves MD MAPK and COX-2 activation.4–6,23,24 Salt-free diet for 1 wk increased plasma renin activity 7.0 ± 1.4-fold in the wild-type (Figure 6) but only 3.4 ± 0.5-fold in GPR91−/− mice (P < 0.05). GPR91−/− mice on normal salt diet had reduced levels of plasma renin activity (0.7 ± 0.1-fold) compared with wild-type; however, this difference was not statistically significant (P = 0.31; Figure 6). Effects of salt-deficient diet on plasma renin activity. Salt-free diet for 1 wk (0 NaCl) increased plasma renin activity seven-fold in the wild-type but only 3.4-fold in GPR91−/− mice. Data were normalized to wild-type normal salt intake (control [C] group) to show fold increases in plasma renin activity. *P < 0.05 DM GPR91+/+ versus DM GPR91−/−; #P < 0.05 C versus DM GPR91+/+ (n = 3 each). These studies were performed to test whether MD cells can sense alterations in local tissue metabolism via detecting accumulating succinate levels in the renal tubular fluid. The metabolic receptor GPR91, which is highly expressed in the kidney and binds succinate as its ligand, was found at the apical plasma membrane of MD cells, which is the critical cell surface for their sensory function. Receptor-binding characteristics indicated that succinate at normal, physiologic levels can activate GPR91 and initiate intracellular signaling. GPR91 activation was associated with ERK1/2 and p38 phosphorylation and activation of COX-2 that ultimately triggered the synthesis and release of PGE2 from these cells. 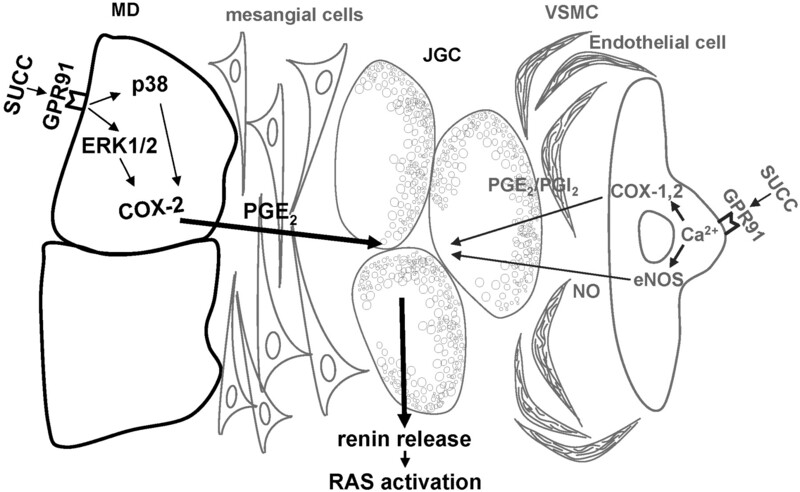 As an important vasodilator and paracrine chemical mediator, PGE2 triggered renin exocytosis from adjacent JG cells (Figure 7). Renin release is the rate-limiting step of the activation of RAS, a complex cascade of enzymes and peptides that are key regulators of body fluid homeostasis, BP, and a central mechanism in the pathology of diabetes. Consistent with high local succinate levels in the kidney and urinary space in diabetes,14 GPR91-mediated upregulation of pERK1/2, p38, and COX-2 was observed in the diabetic kidney that was paralleled with high renal cortical renin content. In addition to the recently described vascular GPR91 signaling,14 MD cell GPR91 in diabetes seems to be a critically important direct link between high glucose levels and RAS activation through alterations in cell metabolism that result in succinate accumulation in the local tissue environment. Schematic illustration of JG GPR91 signaling and RAS activation in diabetes. GPR91 activation triggered by local succinate accumulation increases MD and endothelium-derived PGE synthesis and release mediated by intracellular Ca2+ (in endothelium) and MAPKs p38 and pERK1/2 (in MD). PGE2 via paracrine signaling causes increased renin synthesis and release from adjacent JG cells and activation of the intrarenal RAS in early diabetes. JGC, renin-producing juxtaglomerular cell; VSMC, vascular smooth muscle cell; SUCC, succinate; eNOS, endothelial nitric oxide (NO) synthase. In addition to its localization in MD cells in these studies (Figure 1), GPR91 was recently associated with the renal glomerular endothelium and vascular functions.14 In endothelial cells, GPR91 is coupled to [Ca2+]i signaling and production of nitric oxide (NO) and prostaglandins. Similar to the GPR91-mediated production of PGE2 in MD cells described in this article, the vascular endothelial GPR91 seems to play a complementary role in the diabetic kidney, causing vasodilation (consistent with glomerular hyperfiltration) and (pro)renin release.14 Thus, GPR91 can be coupled with different second messenger signaling systems (MAPKs or [Ca2+]i), depending on the individual cell types where it is expressed. High glucose concentrations among other potential factors in the diabetic milieu are known to trigger pathophysiologic signals mediated by the activation of specific kinase cascades. p38 MAPK, a member of the MAPK family, is activated by physical and chemical stress factors, inflammatory cytokines, and both vasoactive and growth factors.7 At the early stages of experimental diabetic nephropathy, active p38 has previously been localized in the JGA area25,26 and in the distal tubules.26 Consistent with these findings, immunohistochemistry showed that MD cells and adjacent portions of the distal nephron are the major sites of active p38 expression in the diabetic kidney.7 Moreover, it has been found that ERK1/2 is generally but not exclusively responsive to activators of both receptor tyrosine kinases and G protein–coupled receptors.27 In addition, succinate activated ERK in GPR91-transfected cells (293-hGPR91).13 These studies showed that succinate activated p38 and ERK1/2 in MD cells (Figure 2, A and B), consistent with these previous reports and with the sensory function of these cells. 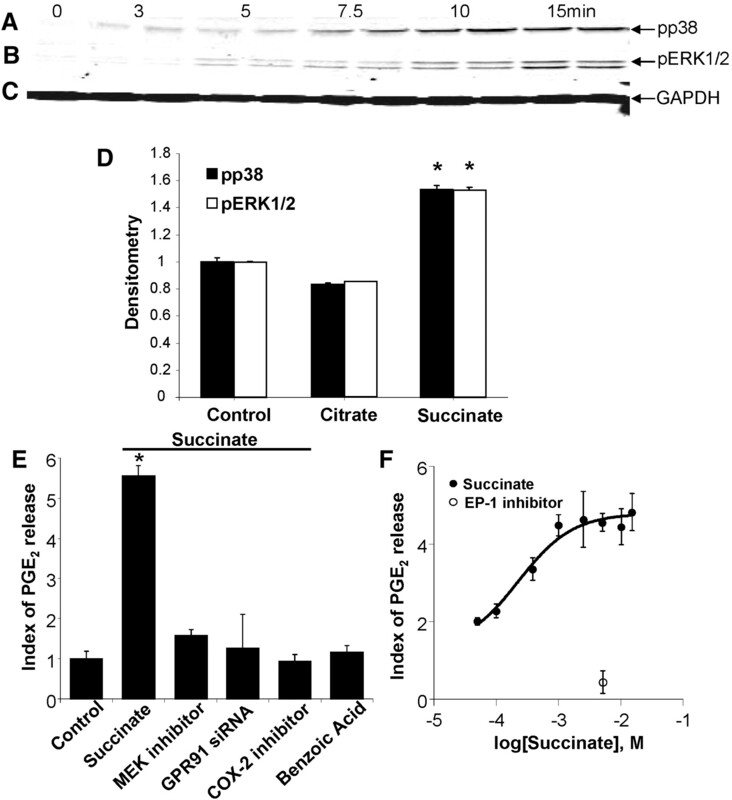 The new findings suggest that ERK1/2 and p38 activation in diabetes is mediated, at least in part, by succinate and GPR91 signaling (Figure 7). In the kidney, COX-1 (constitutive isoform) has been localized to mesangial cells, arteriolar endothelial cells, parietal epithelial cells of Bowman's capsule, and cortical and medullary collecting ducts but not to MD cells or the cTAL.5 In contrast, in all mammalian species, there is COX-2 (inducible isoform) expression in cells of the MD and the surrounding cTAL.23 Importantly, COX-2 is upregulated in diabetes.8,24,31 We measured MD PGE2 production as a result of COX activation by succinate with an EC50 of 229.6 μM (Figure 2E). This value is in exactly the same range as the urinary succinate concentration measured in diabetes,14 indicating that GPR91 signaling is highly relevant in the diabetic kidney. Additional studies using the MEK-1 inhibitor PD98059 in the presence of succinate abolished PGE2 production (Figure 2E), providing further evidence of the role of COX-2 activation by MAPK phosphorylation. Succinate added to the tubular fluid caused significant JGA renin exocytosis in control, nondiabetic mice but failed to do so in kidney tissues dissected from control GPR91−/− mice. This finding serves as evidence that succinate signals through MD GPR91 and liberates renin from the JG cells in a GPR91-specific manner. Importantly, using succinate with MEK-1 inhibitor in control, nondiabetic GPR91+/+ mice, we could not detect renin release (Figure 3C). In the presence of a selective COX-2 inhibitor, the effect of luminal succinate on renin release was also abolished (Figure 3C). These data provide further confirmation that MD MAPK activation and COX-2–derived PGE2 are involved in luminal succinate and GPR91-induced renin release. Before these studies, the exact signals that mediate increased COX-2 expression in diabetes were unknown.8,31 Our findings now identify the metabolic receptor GPR91 as a strong candidate for the underlying signaling mechanism of renal cortical COX-2 regulation at the onset of diabetes. The results of our investigation also established that renal cortical pp38, COX-2, and renin are upregulated in parallel in diabetes and that this phenomenon is entirely GPR91 specific (Figure 4). GPR91-mediated activation of the MD renin signal and generation of vasodilatory prostaglandins shows that MD cells can directly detect and respond to metabolic signals, resulting in the adjustment of important organ functions including renin release and most likely blood flow and glomerular filtration as well.14 These data obtained using two different experimental models, STZ-induced diabetes and salt depletion, suggest that this novel mechanism may be integral in the (patho)physiologic regulation of JGA renin release and RAS activity; however, it should be noted that despite the acute stimulation of JGA renin release by succinate (Figure 3) and the GPR91-dependent increase in renal cortical renin in early diabetes (Figure 4G), plasma renin activity is usually low in diabetes.10 The explanation for this discrepancy could be prorenin. Although the JGA is recognized as the primary source of active renin and the gatekeeper of early RAS activation, the elevating angiotensin II levels eventually suppress JGA renin but stimulate its synthesis mainly in the form of prorenin in the collecting duct system.12 In fact, plasma prorenin levels are high in diabetes,32 and the collecting duct was suggested as the main source.33 Prorenin activation via binding to the recently identified prorenin receptor34 may explain the persistent intrarenal RAS activity in diabetes despite the suppression of JGA and plasma active renin.10 Further studies are needed to evaluate GPR91 dependence of the key renal functional parameters in vivo of control and different (patho)physiologic states, including GFR, proteinuria, systemic BP, renal histology, etc. So far, no overt phenotypes of control GPR91−/− mice have been noted,13,14,17 suggesting the involvement of GPR91 in pathophysiologic mechanisms, rather than playing a major role in normal/physiologic function. Consequently, we believe that under physiologic conditions, the MD GPR91 signaling cascade may serve to modulate RAS activity and blood flow regulation (oxygen supply) to the kidneys on the basis of local metabolic needs and/or to help remove metabolic waste products through glomerular hyperfiltration; however, it may be a major mechanism linking metabolic diseases (diabetes, metabolic syndrome) with RAS overactivation, systemic hypertension, and organ injury. GPR91 is a potential new therapeutic target to protect the kidneys from complications of metabolic diseases. All experiments were performed under protocols approved by the Institutional Animal Care and Use Committee at University of Southern California. Breeding pairs of GPR91+/− mice (C57BL6 background) were provided by Amgen (Thousand Oaks, CA) and bred at University of Southern California. Male mice were used in all experiments and were housed in a temperature-controlled room under a 12-h light-dark cycle with water and standard food available ad libitum. Some mice received salt-deficient diet for 1 wk (TD 90228: 0 NaCl; Harlan Teklad, Madison, WI). In some mice, the STZ model of type 1 diabetes was used as described previously.35,36 Briefly, diabetes was induced by daily STZ (50 mg/kg intraperitoneally) injections for 4 d. Blood was collected from the tail vein, and daily blood glucose levels were measured with test strips (Freestyle Blood Glucose Monitoring System; Abbott Laboratories, Abbott Park, IL) to confirm the successful induction of diabetes (blood glucose levels >400 mg/dl). Experiments on animals were performed within 4 wk of STZ injection, during the early phase of diabetes. Mice were characterized by PCR using genomic DNA extracted from tail biopsies. DNA was digested with the REDExtract-N-Amp Tissue PCR Kit (Sigma-Aldrich, St. Louis, MO). Routine genotyping by PCR was performed using the following primers: Neo3A (5′-GCAGCGCATCGCCTTCTATC-3′), GPR91−/− reverse (5′-GCTGCCTTCTGATTCATGTGG-3′), and GPR91−/− forward (5′-GTCGTCTGGGCCTTAGTGACC-3′). A superficial afferent arteriole and cTAL with the attached glomerulus were microdissected from freshly harvested mouse kidney slices. The afferent arteriole and cTAL were cannulated and perfused using a method similar to that described previously.22 Briefly, dissection media were prepared from DMEM mixture F12 (Sigma-Aldrich). FBS (Hyclone, Logan, UT) was added at a final concentration of 3%. Arteriole perfusion and bath fluid was a modified Krebs-Ringer-HCO3 buffer containing 115 mM NaCl, 25 mM NaHCO3, 0.96 mM NaH2PO4, 0.24 mM Na2HPO4, 5 mM KCl, 1.2 mM MgSO4, 2 mM CaCl2, 5.5 mM d-glucose, and 100 μM l-arginine. Tubular perfusion was an isosmotic, low-NaCl–containing Ringer's solution consisting (in mM) of 25 NaCl, 120 N-methyl-d-glucamine cyclamate (NMDG cyclamate), 5 KCl, 1 MgSO4, 1.6 Na2HPO4, 0.4 NaH2PO4, 1.5 CaCl2, 5 d-glucose, and 10 HEPES. The solutions were aerated with 95% O2/5% CO2 for 45 min, and their pH was adjusted to 7.4. Each preparation was transferred to a thermoregulated Lucite chamber mounted on the Leica inverted microscope. The preparation was kept in the dissection solution, and temperature was kept at 4°C until cannulation of the arteriole and tubule was completed and then was gradually raised to 37°C for the remainder of the experiment. The bath was continuously aerated with 95% O2/5% CO2 throughout the whole experiment. The acidotropic fluorophore quinacrine (Sigma-Aldrich), which is selective for dense-core secretory granules, was used for labeling the renin granules.20,21,35 The nuclear staining Hoechst 33342 and DIC image were used to visualize the glomerulus with its attached afferent arteriole and cTAL. For ratiometric Ca2+ imaging, the fluo-4/fura red pair was used and calibrated as described previously.22 In some microperfusion experiments, the selective MEK-1 (MAPK) inhibitor PD98059 (10 μM; Sigma) or SC58236 (50 μM; Pfizer, Groton, CT), a selective COX-2, inhibitor was used. Preparations were visualized using a two-photon laser scanning fluorescence microscope (TCS SP2 AOBS MP confocal microscope system; Leica-Microsystems, Heidelberg, Germany). A Leica DM IRE2 inverted microscope was powered by a wideband, fully automated, infrared (710 to 920 nm) combined photo-diode pump laser and mode-locked titanium:sapphire laser (Mai-Tai; Spectra-Physics, Mountain View, CA) for multiphoton excitation of quinacrine (at 860 nm) and Hoechst 33342 (at 760 nm) and by HeNe (594 nm) and Ar (488 nm) lasers for conventional, one-photon excitation confocal microscopy of AF594 and fluo-4/fura red, respectively. Images were collected in time series (xyt) and analyzed with Leica LCS imaging software. Total RNA was purified from confluent MMDD1 cells, JG cells, and whole-kidney tissue homogenates of GPR91+/+ and GPR91−/− mice using a Total RNA Mini Kit (Bio-Rad). RNA was quantified using spectrophotometry and reverse-transcribed to single-stranded cDNA using avian reverse-transcriptase and random hexamers according to the manufacturer's instructions (Thermoscript RT-PCR system; Invitrogen, Carlsbad, CA). cDNA (2 μl) was amplified using a master mix containing Taqpolymerase (Invitrogen) and the primers GPR91 sense, 5′-TGTGAGAATTGGTTGGCAACAG-3′ and GPR91 antisense 5′-TCGGTCCATGCTAATGACAGTG-3′, each at a final concentration of 1.0 μM. The PCR reaction was carried out for 30 cycles of the following: 94°C for 30 s, 55.4°C for 30 s, and 72°C for 30 s. The PCR product was analyzed on a 2% agarose gel to identify GPR91 fragments of approximately 330 bp. On the first day of the study, MMDD1s were trypsinized and cells were resuspended at a concentration of 100,000 cells/ml in antibiotic-free complete DMEM. Cell suspension of 100 μl was added to each well of a 96-well plate and incubated overnight at 37°C with 5% CO2. The next day, MMDD1s were transfected using the protocols validated for the DharmaFECT 1 Transfection Reagent and ON-TARGETplus SMARTpool of four GPR91 siRNAs (Dharmacon, Chicago, IL). Medium was removed from each well of the 96-well plate, and 100 μl of transfection medium was then added to each well. Cells were incubated at 37°C in 5% CO2 for 48 h, transferred to larger plates, and then cultured in complete MMDD1 medium for studies. RNA was extracted from cells and amplified to validate inhibition of GPR91 synthesis as described previously.14 Functional confirmation of GPR91 knockdown was provided by fluorometric and immunoblot studies on cells and their lysates, respectively. Cells retained adequate GPR91 silencing for at least three passages. Manually dissected slices of kidney cortex were homogenized in a buffer containing 20 mM Tris-HCl, 1 mM EGTA (pH 7.0), and a protease inhibitor cocktail (BD Bioscience, San Jose, CA). Protein (40 μg) was separated on a 4 to 20% SDS-PAGE and transferred onto polyvinylidene difluoride membrane. The blots were blocked for a minimum of 1 h with Odyssey Blocking Buffer (LI-COR Biosciences, Lincoln, NE) at room temperature. This was followed by an incubation of the primary antibody (1:5000 Renin [Fitzgerald, Concord, MA]; 1:1000 COX-2 [Santa Cruz Biotechnology, Santa Cruz, CA]; 1:1000 pp38 [Cell Signaling Technology, Danvers, MA]) overnight at 4°C, along with glyceraldehyde-3-phosphate dehydrogenase (1:5000; Ambion, Austin, TX) in 20 ml 1× PBS (OmniPUR; VWR, San Dimas, CA), 20 ml of Odyssey Blocking Buffer (LI-COR Biosciences) and 20.0 μl of Tween-20 (Sigma Aldrich) solution. After incubation, blots were washed with PBS-T and 1× PBS plus 1:1000 Tween-20, blots were then incubated in 20 ml of PBS, 20 ml of Blocking Buffer, 20 μl of Tween 20, and 20 μl of 10% SDS, with goat anti-mouse (1:15,000; LI-COR Biosciences) and goat anti-rabbit secondary antibodies (1:15000 LI-COR Biosciences). Blots were then visualized with Odyssey Infrared Imaging System, Western Blot Analysis (LI-COR Biosciences). MMDD1 cells were grown to confluence as previously described. Cells were trypsinized, pelleted, and incubated in serum-free medium for at least 1 h before treatment. Serum-free medium was removed, and cells were resuspended and incubated in 500 μM succinate for up to 15 min, with the control sample remaining in serum-free medium. After treatment, cells were lysed using CellLytic-M lysis buffer (Sigma) according to the manufacturer's instructions. Cells were then centrifuged at top speed, and supernatant was collected for assay. Samples were run on 4 to 20% gels and probed for pp38 (1:1000) and pERK1/2 (1:1000; both from Cell Signaling Technology), treated with a secondary, and visualized as described previously. Data are expressed as mean ± SEM. Statistical significance was tested using Single Factor ANOVA. Significance was accepted at P < 0.05. This work was supported by National Institutes of Health grants DK64324 and DK74754 to J.P.-P. I.T. was a National Kidney Foundation Postdoctoral Fellow. We thank Amgen for providing breeding pairs of GPR91 knockout mice.